ZION KLOS (zion.klos@marist.edu) is an assistant professor in the Department of Environmental Science and Policy, Marist College, Poughkeepsie, NY, and LUCY HOLTSNIDER (lholtsnicer@gmail.com) is a teaching assistant in the Department of Art at the University of California, Santa Barbara, CA. Psychological research suggests that human engagement with an environmental problem such as climate change requires not only the cognitive understanding of the problem, but also an intuitive, or affective, engagement with the problem to motivate action (Sheppard, 2005). Traditional cognitive-first approaches to science communication may fail to fully engage the general public (and students) with these environmental problems because they lack the ability to effectively engage the crucial social-psychological aspects of intuition, emotion, and affect (Zajonc, 1984). Science communication collaborations which include creative actors from the worlds of art, humanities, and design (Eldred, 2016) provide a much stronger overlap of cognition and intuition when communicating about such issues as climate change (Neill et al., 2014). However, collaborative efforts between scientists and artists are still relatively rare. During the summers of 2016 and 2017, we collaborated to teach an experiential, place-based course titled "Visual Environmental Communication" through Colorado College — a small liberal arts college in Colorado Springs, Colorado. This course was inspired by our recent Climate Odyssey project (climateodyssey.org), where we combined art, science, and a year-long sailing expedition to develop new interdisciplinary forms of climate science communication. In this article, we will highlight our unique examples of art-science overlap done in both the field and the classroom through primarily visual forms of science communication (Gough, 2014). Through a critical reflection focused on these examples, we hope to demonstrate ways art-science collaborations like these may become more successful in helping science be better accepted, understood, and applied by students and the public. Figure 1: Example page from the interactive digital map created from the data collected during the Climate Odyssey expedition (climateodyssey.org/interactive-map). Each triangular image within the map is linked to blog entries, interviews, or other external scientific resources designed for public consumption. [Image provided by Lucy Holtsnider]. Provenance: Example page from the interactive digital map created from the data collected during the Climate Odyssey expedition (climateodyssey.org/interactive-map). Each triangular image within the map is linked to blog entries, interviews, or other external scientific resources designed for public consumption. [Image provided by Lucy Holtsnider]. Over the 2015-2016 academic year, we embarked on the sailing portion of our first art-science collaboration, Climate Odyssey. We began our journey in the Great Lakes, continued through the Erie Canal, along the Eastern Seaboard, and concluded in the tropics. Over the course of the year we sailed over 3,000 miles past 13 states with the goal of creating resources that communicate climate change science in a visual and relatable way to the American public. We spoke with non-profits, land managers, and fishermen along our route about changes they were observing and adapting to in their local areas. We are now sharing our photographs and documented encounters through a tangible artist's book, interactive digital map (climateodyssey.org/interactive-map), blog, and a series of K-16 lesson plans (climateodyssey.org/for-teachers). 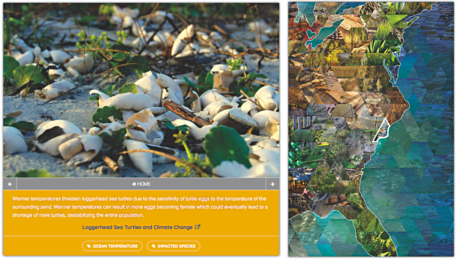 Each of our images added to the artist's book and digital map are linked to relevant blog entries and other external scientific resources, making the digital map both a piece of art and a unique education tool for sharing climate science (Figure 1). We have worked to share our multi-media resources with the public via libraries, galleries, and K-16 classrooms in coastal communities. The lesson plans cover a variety of learning goals, including the ability for students to: develop a sense-of-place for their local coastal environments; understand and differentiate the impacts, adaptations, and drivers of climate change; understand the interdisciplinary complexity of environmental problems through exploration of coupled natural-human systems; and go beyond the content in the interactive map to understand the role of science in society — showing the utility of objective data, peer-reviewed publications, and outreach — and how these work together to ultimately inform public policy and decision-making processes. Figure 2: Example of the place-based, interdisciplinary learning that took place during the course "Visual Environmental Communication." Students spent a month working both in and with content from the Colorado Rockies—the end goal being the creation of both quantitative and artistic pieces for communication of climate science with the local public. [Photo by Zion Klos]. Provenance: [Photo by Zion Klos]. 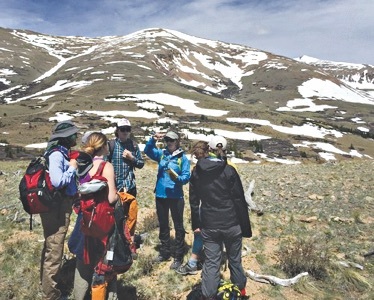 During our Climate Odyssey expedition, we were asked by Colorado College to design a course building off the interdisciplinary techniques and theory we were applying, with a focus on climate-related issues appropriate for undergraduates to tackle in Colorado. From this request, the course "Visual Environmental Communication" was born. The course was taught the past two summers as a block-format (3.5 week), expeditionary course with the goal of teaching the theory and best practices for communication of environmental issues through visual mediums (see syllabus at: zionklos.com/courses). We used place-based learning in the Colorado Rockies (Figure 2), visual spatial techniques (Geographic Information Systems or "GIS"), and multiple visual art mediums (drawing, photography, graphic design, book-making, etc.) to inspire and create visualizations that can inform or invoke emotion regarding issues affecting the local human-natural environment (specific assignments can be found on syllabus). In addition to learning basic skills in GIS and visual art, the students also learned how to investigate climate science through an interdisciplinary field-based lens, specifically how global phenomena translate into local issues and solutions within the Colorado Rockies. To solidify understanding gained through on-campus learning and extended field excursions, students collected primary scientific data, analyzed secondary spatial data from existing datasets, and worked towards the creation of environmental narratives that share the science and emotion of climate change with the public. Throughout the course, we evaluated students on their ability to observe, analyze, interpret, and communicate social, ecological, and geological phenomena through both scientific and artistic approaches. Class periods were frequently split into two parts, with Zion teaching climate or Earth science and Lucy introducing a variety of artistic mediums. The students were exposed to collage, color theory, iPhone photography, and basic book binding during the art-focused lessons. For their final project, which included both independent visual communication projects and a collective public presentation and gallery exhibition (Figure 3; more details and examples of students' final work at: lucyholtsnider.com/ev120), the students were asked to choose both a regional climate change impact and an artistic medium through which to explore it. The creative solutions the students came up with were varied and thrilling — from photography, to book arts, to performance art, no two responses were the same. Grading the projects provided a particular challenge in light of the potential for the subjective nature of visual art to clash with the rational tone of scientific discourse. The students were graded on both their effort, as assessed during multiple graded drafts, as well as the quality, both artistic and scientific, of their final deliverables. Overall, the course was designed to build skills in the scientific method, quantitative analysis, critical critique, and professional communication. Figure 3: An example of students' final place-based, art-science creations. The prompt for the project asked them to create paired work that is both aesthetically captivating (visual art focused) and scientifically grounded (data focused). 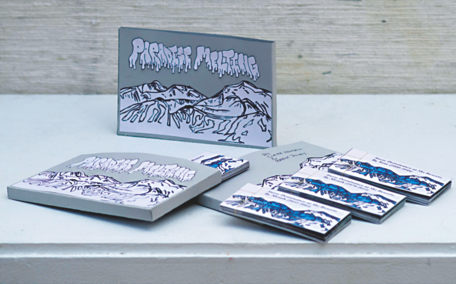 An artistic flipbook showing the projected loss of snow via picture and dance was paired with original analyiss of future projected snow-season length at ski resorts in Colorado calculated using data from Klos et al. (2014). [Photo by Lucy Holtsnider]. Provenance: [Photo by Lucy Holtsnider]. Ultimately, there are many benefits to collaborative efforts between science and art, namely the ability to accomplish something highly unique and engaging to the public, the students, and the core collaborators. Through more art-science collaborations like those described here, we can improve interdisciplinary communication strategies that increase student cognitive understanding and intuitive engagement and ultimately help society better deal with the complex environmental problems we face. Eldred, S.M., 2016, Art–science collaborations: Change of perspective: Nature, v. 537, p. 125–126. Review of Literature on Information Visualization: Leonardo, v. 50, p. 47–52. Klos, P.Z., Link, T.E., and Abatzoglou, J.T., 2014, Extent of the rain-snow transition zone in the western U.S. under historic and projected climate: Geophysical Research Letters, v. 41, p. 1–9. Neill, S.J.O., Smith, N., and O'Neill, S.J., 2014, Climate change and visual imagery: Wiley Interdisciplinary Reviews: Climate Change, v. 5, p. 73–87. Sheppard, S.R.J., 2005, Landscape visualisation and climate change: The potential for influencing perceptions and behaviour: Environmental Science & Policy, v. 8, p. 637–654. Zajonc, R.B., 1984, On the primacy of affect: American Psychologist, v. 39, p. 117–123.